Fulfilling the promise of the All-in-One series, this complete reference serves both as a study tool and a valuable on-the-job reference that will serve readers beyond the exam. 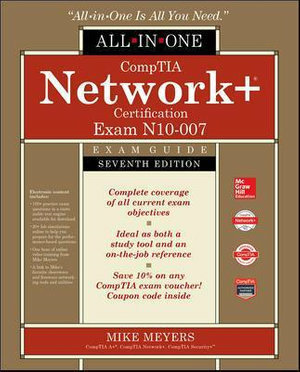 CompTIA Network+ Certification All-in-One Exam Guide, Seventh Edition (Exam N10-007) also includes access to free video training and interactive hands-on labs and simulations that prepare you for difficult performance-based questions. A valuable pre-assessment test enables readers to gauge their familiarity with the test's objectives and tailor an effective course for study.